Most visitors and hikers to Rocky Mountain National Park bypass Marigold Pond. Located close to Lake Helene as well as Two Rivers Lake, Marigold Pond is located just off trail and out of view. 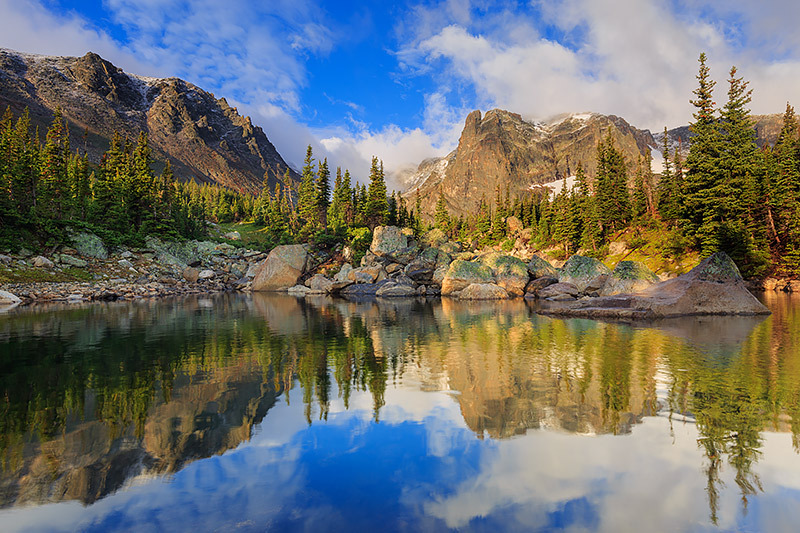 It's a spectacular but small mountain lake that allows for impressive view of both Notchtop Mountain and Flattop Mountain. In this image, the calendar still says summer but that means little in Rocky Mountain National Park. Fresh snow has coated the high crags of Notchtop Mountain and Flattop Mountain. The morning sun helps to break up the clouds which blanketed the peaks overnight revealing the new snow. Photo © copyright by Thomas Mangan.